One of the noteworthy features of the last few decades is the several developments taking place in the construction industry, concrete technology, design techniques and in new construction materials. Plain concrete possesses very low tensile strength. It has get limited ductility and little resistance to crack propagation. Micro cracks develop in the material during its manufacture due to its inherent volumetric and micro structural changes and an essentially discontinuous heterogeneous system. This exists even before nor external load is applied. It has little resistance to tensile crack propagation and hence under load virgin micro cracks develop at a low tensile cracking strain of the order of 100 x 10 m/m corresponding to 30 to 40% of ultimate strength in compression which on further loading eventually lead to uncontrolled growth of micro cracks. This, in turn, results in a low fracture toughness, limited resistance to impact and explosive loading. For the beam reinforced with steel bar along the tension face and if loaded, the reinforcing action results chiefly from the higher modulus of elasticity of steel, until the tensile strength of concrete is exceeded. 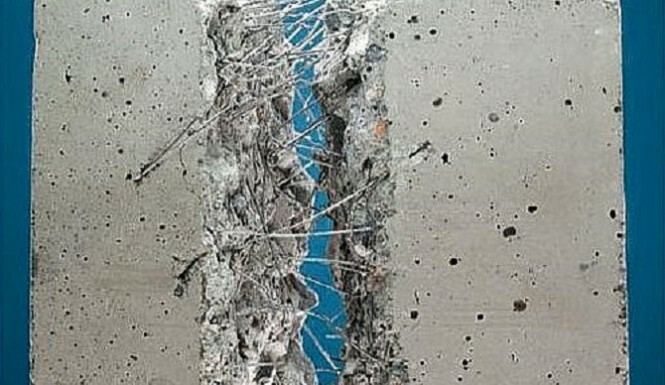 After the tensile strength of concrete is exceeded, the cracks are initiated on the tensile part of the beam. At the crack the steel resist the entire tension. If not reinforced, the elongated crack would have developed collapse. In recent years, there have been many reports of the progress, through the research laboratories to change the properties of brittle concrete by inclusion of short discontinuous fibres randomly distributed throughout the concrete matrix. This work initiated by Romualdi and intensified during the last few decades rightly continues in centres throughout the world. To overcome the low tensile strength of concrete in 1963, Romualdi and Batson showed that high strength and high elastic modulus steel fibres in the concrete increases the strength of concrete considerably. The effective reinforcement of the matrix and the effective transfer of stress between the fibre and matrix depend upon many factors, but the properties of fibre reinforced composites depend primarily upon the type of fibre. One such fibre that has found considerable application in mortar and concrete is steel. The fibre reinforced concrete has some unique properties of strength, stiffness and resistance to crack growth which are not shared by plain concrete. The strength of concrete at first crack is appreciably increased by the crack arresting mechanism, of the fibres and the ultimate strength is also substantially increased because extra energy is needed to sense fracture of the fibres reinforcing the concrete. Romualdi and Batson showed that the functions of fibre is essentially of crack arrest. They showed that the stress required to extend a crack beyond the area enclosed by the adjacent groups of fibres is inversely proportional to the square root of the fibre spacing. It was claimed that the effect of fibres on tensile strength of concrete becomes quite significant at fibre spacing below about 1.27 cm even when the fibres are short and randomly oriented. The low modulus fibres such as nylon, polypropylene, polyethylene are capable of large energy absorption but don’t lead to strength improvement, however they impart toughness and resistance to impact and explosive loading. The high strength, high modulus fibres such as steel, glass, asbestos and carbon which produce strong composites, primarily impart strength and stiffness to the composite and also dynamic properties to varying degree. The details regarding the various research experiments, typical properties of different types of fibre reinforced concrete are reflected in the future articles to come now onwords. The cost of fibre reinforced concrete is greater than the cost of conventional concrete. However, economics must be related to the performance and serviceability. Of source, we also believe that it would be equally wrong to pretend that fibrous concrete will provide as universal panacea for all concrete problems, nor it is likely to replace conventional structural concrete in toto. However in just two / three decades, fibre reinforced concrete has developed from a mere laboratory experiment into a proven construction material for the future. We believe that despite the remarkable progress achieved in recent times, there is still a vast future potential for the development of fibre reinforced concrete of all kinds. Thus, in our opinion, the fibre reinforced concrete is of considerable importance to use in developing countries. And so if we are to advance further, we must make sure that technology learnt today is put into the good use of mankind tomorrow. Previous PostPrevious Portland Slag Cement: All You Like to Know!